Providing Bible studies and other spiritually related material by mail is an effective, convenient, and rewarding method of community outreach. It is also a excellent way to minister to prison inmates with whom you would otherwise have no contact. This approach to ministry can be done from your home as a personal ministry, or as a group in conjunction with a religious organization. 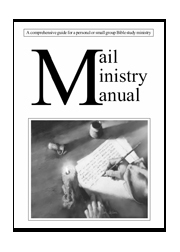 This manual provides all the concepts, instructions, and materials (except the Bible study lessons) necessary for the inexperienced to begin and continue a mail ministry. 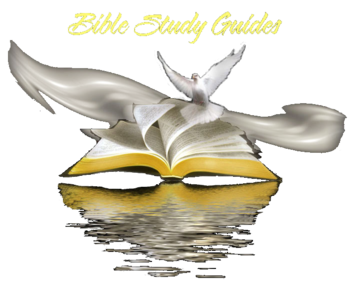 The ideas presented can be utilized with any Bible study series. This manual can serve as a valuable resource of new concepts that existing ministries can incorporate into their programs. It also contains master templates to incorporate the concepts presented. These may be freely copied and used as presented or ideas gleaned from them to design your own. The materials and concepts presented in this manual are quite comprehensive. They has been derived from years of experience. As you consider starting your own mail ministry dont be overwhelmed. The ideas presented can be employed in part or whole based on your particular application. You can begin your ministry in a very basic format. Then, as you are led by the Holy Spirit, develop it further. This guide is meant to be a training manual, a resource for supportive materials, and a reference during this growth process. May the Lord grant you a tremendous blessing as you share your love for Him with others.